Private Storage Available at Our Florida Warehouse. Moving house or office typically go hand in hand with renting storage space. For your convenience, Moving On Up™ offers local, private storage for the state of Florida and third-party public storage options for Non-Florida interstate moves anywhere in the continental US. If for any reason you require extended storage with your relocation we have the solution for you! Selling your old house and closing the deal on a new one can sometimes be an inconvenient transition with awkward time gaps in between. If you are in need of in-between storage do to real estate delays or apartment lease restrictions, worry not. Solve your real estate woes with Moving On Up's one month FREE storage promotion, included with any interstate move into or out of the state of Florida! Moving On Up™ has a large, private storage warehouse located at our South Florida dispatch headquarters (see image on right) for state-to-state relocations. where we can hold your items until you are ready to move and low month-to-month rates for extended stays. 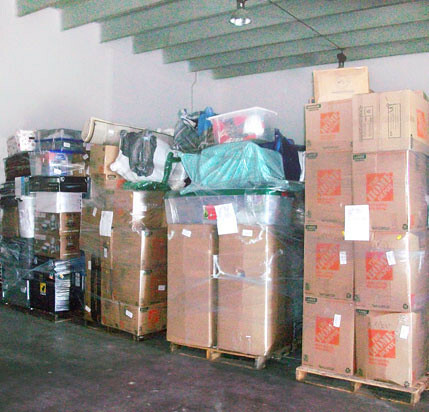 Private storage is not the same as the public storage facilities you may be familiar with. Moving storage is very different, since your personal items are stored together ready to be shipped to your final destination on your determined delivery date. When the movers come to your house to load the moving truck with your boxes and furniture, each item is marked on an inventory and then packed into the moving truck. When the movers arrive at the dispatch warehouse, each item is labeled with one or more moving labels that state your name, delivery state, contact phone and job reference numbers. The items are then carefully placed on wooden palettes with heavier, sturdy items on the bottom. 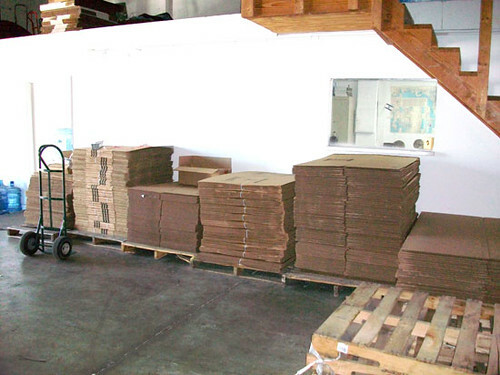 One or more palettes may be required depending on the size of your move. Once all of your items are unloaded from the truck onto palettes, your entire shipment is thoroughly wrapped in protective shrink wrap to ensure that nothing will be left behind. Then, using one of the palette fork lifts, your respective palettes are placed together in the warehouse and labeled with detailed inventory lists on each side. When you are ready for your delivery, the palettes are removed from the warehouse and unloaded onto your delivery tractor-trailer, each item being rechecked on the inventory sheet prior to departure. For this reason, this our warehouse is a "private storage" facility. Only Moving On Up™ employees are permitted inside the warehouse for your security. Furthermore, unless specified prior to your move, no items can be removed from storage unless you choose to relocate the entire shipment together upon completion of your storage needs. For more information, please review our Storage Guidelines. The above picture was taken inside our South Florida warehouse on March 4th, 2010. If you would like to see more actual photos of the Moving On Up™ dispatch offices, truck fleet, warehouse interior and moving supplies, please visit Moving On Up's new Flickr page. We will be continuously adding new pictures, so check back on our photo stream for new updates! The private storage facility is under 24 hour video surveillance, accessible only by Moving On Up™ staff. For added security, high-value items such as LCD televisions, large electronics, golf bags and bicycles, are placed into Moving On Up™ locked storehouse. Please be sure to inform your moving consultant of any high-value items you may wish to put into storage. We also strongly suggest that you purchased full-coverage insurance from MovingInsurance.com at least two days prior to your pick-up day for your move. OUr private storage facility is temperature-controlled, capable of storing properly boxed photographs, business records, paperwork and general electronics. However, storing perishable food items, live plants or animals is not permitted. For more information on what items cannot be moved through a moving company, please visit our Frequently Asked Questions page. Moving On Up™ offers low, competitive rates and offer secure payment options such as online Google Checkout invoices (sent directly to your email), over-the-phone credit card authorizations, as well as mail-in check payments. For your convenience, we accept personal check, money order, or a cashier's check as payment for storage. We do request, however, that your mail-in storage payment be posted at least three (3) days prior to your storage due date. Times are tough, and more and more people are relocating for economic reasons or better job opportunities. We understand the nature of today's economy and the dire need for flexible options for extended storage for an undetermined length. Moving On Up™ storage has no contracted time restraints, and we will consider pro-rating your storage on a case-by-case basis. If you need storage and would like to speak to a representative to discuss your storage options, please contact us at 1-800-945-9569 and request the storage department.